A bigger entertainment story than most of the summertime films was Mel Gibson’s July 28 arrest for suspicion of DUI by a Malibu, CA. sheriff. Of course what set Gibson’s reckless driving on the Pacific Coast Highway apart from others were the religious epithets he spewed at the arresting officers. 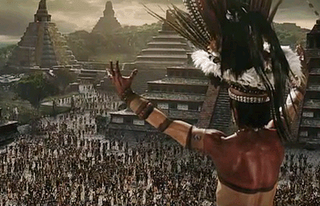 After weeks of commentary about the extant of damage to Gibson’s standing in Hollywood and what he needs to repair his public profile, new questions arise regarding the ability for critics to watch “Apocalypto” free of biases regarding Gibson and his shameful, anti-Semitic and anti-woman remarks on the night of his arrest. Gibson’s dilemma is a common one, a need for people to separate the life of the artist from the finished art. It’s no different from the current pleas of German novelist Günter Grass who wants readers to accept and understand his newly revealed Nazi past. My critic’s pledge to Gibson is this: I’ll write about “Apocalypto” fairly, treating it like any other film from goofball releases like “Jackass 2” to event releases like “The Departed.” I’ll emphasize dramatic content, filmmaker technique and performances over commentary about your pleas for forgiveness or lack thereof. I must admit that I’m not the least bit interested in whether you take on a “Mea culpa” public relations tour or not. After all, as a person, what more do you have to tell us that we haven’t already heard before? But as a filmmaker, well, I’m anxious to watch “Apocalypto” and I think I’ll always be anxious to see any of your new films. Looks like I have already made the split between Gibson the suffering man and Gibson the talented film artist. Will ‘Open Season’ in 3D bring kids back to theaters? Just spent a rainy weekend afternoon at a 3D screening of the kids cartoon comedy “Open Season” with my eight-year-old son and the experience led to thoughts about more than the number of quality laughs in the movie. Warching the film with a large audience of children, all of us sporting 3D glasses; may provide answers to the rising dilemma of teenagers choosing gaming, text messaging and other handheld leisure activities over repeated trips to the movies. 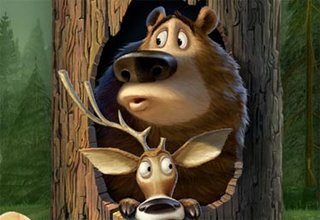 “Open Season,” a slapstick comedy about a domesticated bear named Boog (voice of Martin Lawrence) trying to adjust to life in the forest with the help of a nutty deer named Elliot (voice of Ashton Kutcher), may be a kids cartoon movie like any other. What separated this trip to the movies from the typical couch potato experience were an IMAX-sized screen and a steady stream of smile-generating 3D effects. Basically, no matter how good you’re home theater system may be, it’s impossible to match the wow of a giant IMAX picture and the virtual feel of 3D images. The big experience made the run-of-the-mill “Open Season” better, more fun and a trip worth taking. If 3D can boost the slapstick gags in a movie like “Open Season,” it’s safe to assume that it would also help current teen-targeted comedies like “Jackass 2” and “School for Scoundrels.” After all, teens, like their younger siblings, want something different, a bigger, flashier movie experience. Then again, the simple idea that bigger is better may not be the answer theater owners and movie distributors are seeking. I asked my eight-year-old if he had the choice between watching “Open Season” on his video iPod or going to the cinema, what would he choose? His answer was a toss-up. So I pushed the question further, emphasizing the joy of watching a movie on a big screen. Leave it to an eight-year-old to perfectly sum up the challenge facing movies in an era of handheld, downloadable entertainment.